If I have bed bugs, won’t I be able to see them? The short answer is: generally, no. Although fully-grown adult bed bugs can grow to around 5-7mm in length (that’s 1/5th of an inch) and may be visible to the naked eye, most bed bugs are TINY. 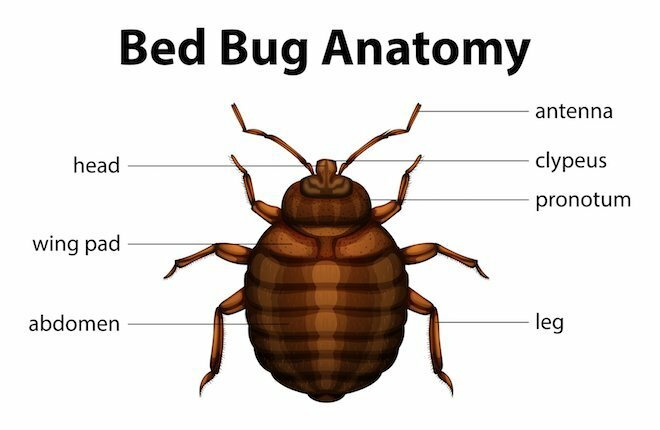 That’s why below I’ve listed lots of different signs of bed bugs so that you can determine whether you have bed bugs or not even if you don’t see them with your eyes. Young bed bugs (also called larvae or nymphs) are much smaller so they’re even harder to see. In addition, bed bugs generally feed around the early hours of the morning when we move less so that their feeding isn’t disturbed. A feeding session typically lasts only around 15 minutes, and most bed bugs only feed every 3-4 days (it’s possible for them to go almost one year without food). All of these factors together mean that you are very unlikely to see bed bugs just randomly in your home unless you have a very significant infestation. Of course, if you use one of the bed bug catcher devices I describe below, then you may be able to catch a bed bug and therefore actually see one. Sometimes, if you do see a small bug on your bed or couch, it can be scary and you may mistake it for a bed bug when it’s some other insect. So, here’s an image of a fully-grown adult bed bug so you can make sure that the bug you saw is actually a bed bug and not some other poor creature. This often the first sign people receive that they have bed bugs at home. They wake up and spot bites on their skin and start worrying about bed bugs. You may think that it would be obvious if bed bugs were biting you on a regular basis, but it’s actually not a reliable method of determining whether or not you have bed bugs. Bites can vary from person to person, looking like a rash, a reddish raised bump, or even nothing. On some people, one or two puncture marks may be seen, but on many people, no marks are visible at all. The bite marks that are typically described as bed bug bites are 3 bites in a row on your legs or torso (known as the breakfast, lunch, and dinner bites). The suggestion is that you moved in your sleep to disturb their feeding so they move on and bite you again and so there are often 2-3 bites in a row. However, most people who get bed bugs don’t see 3 bites in a row. Given the fact that bite marks can vary so much from one person to another, just studying the bites alone is not an accurate method of determining whether or not you have bed bugs. 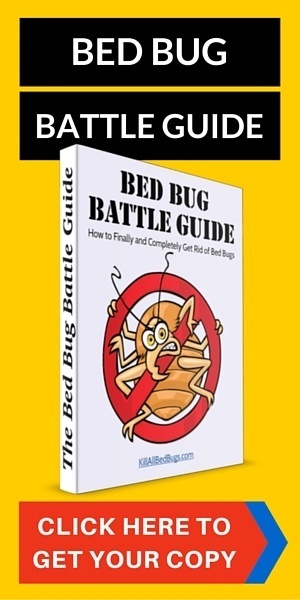 Even a doctor cannot tell the difference between bed bugs and other possible reactions or bites, which makes this method a highly unreliable way of telling whether you have bed bugs or not. I’ve seen a lot of people get worked up because they wake up with bites and they actually never have bed bugs! Although this method is by no means full-proof, it’s the first thing you should look for. Like most other animals, bed bugs also leave feces, which may appear as small dark brown or reddish dots or streaks on your mattress or sheets. These stains are best detected if you use white mattress covers and white sheets and pillow covers. The downside is that a small infestation may not leave any stains, and even if they do, they can be hard to find, since they’re often located in crevices. However, this is a great bed bugs sign if you’re staying at a hotel. So, when you get to your room at the hotel, leave your luggage outside or in the bathroom away from the bed, and then lift up the sheets carefully and look at the mattress and any blankets on the mattress (i.e., the things that don’t get changed after each visitor). See if you spot any signs of bed bugs on the mattress corners and in the folds. Bet you didn’t know that there are actually dogs trained for much of their lives to sniff out bed bugs and bed bug eggs huh? Although much more expensive than the other methods, this is the most accurate way to detect bed bugs, since the dogs are typically up 95% accurate, and it takes less than 10 minutes per room. 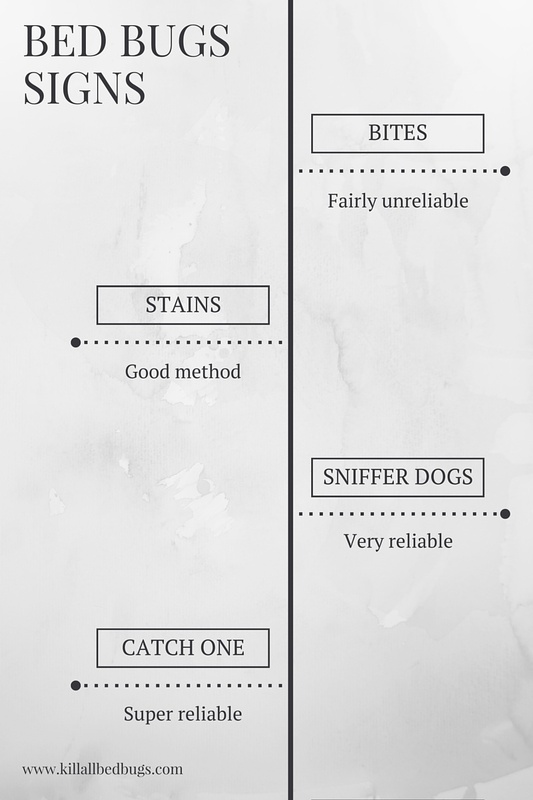 One potential downside to using sniffer dogs is that the companies offering these services are often connected to extermination services. In such cases, many people suspect that the companies report instances of bed bugs just get you to engage their extermination services. However, if you really want to make sure you have bed bugs, then this is a quick and easy way. The last sign of bed bugs is actually to see bed bugs. As I explained at the beginning of this article, it’s actually quite tough to see bed bugs with the naked eye scanning around your room as they’re so small. However, you can set traps to catch them so that you know for certain that you have a bed bug infestation at home. This method involves placing double-sided tape around your mattress, box springs, and bed frame, as well as other furniture that you think might be infected. For example, if you have carpet, then you might want to place tape along the bottom of your walls, and if you have fabric sofas, then you might place tape around the legs of your sofa. Ideally, the tape will trap a few of the bed bugs so that you have proof. Unfortunately, if you have very few bed bugs, it may require a lot of luck for those few bed bugs to get stuck on the tape. In addition, please don’t think that this is a way of exterminating them, since bed bugs will lay eggs and new bed bugs will hatch even if you managed to catch all the existing ones on the tape. Also note that because bed bugs are attracted to carbon dioxide, this method will not work for vacant rooms since the bed bugs will not move when the room isn’t occupied. This is a variation of the double-sided tape method. In this case, you can simply rub Vaseline around the legs of your bed (or bottom of wall or legs of sofa). Like tape, Vaseline traps the bed bugs. Remember where you put the Vaseline and check the Vaseline regularly for any bugs that may be stuck in it. Wipe off and reapply the Vaseline every week as the Vaseline will gather dust and make it harder to see any small bugs that might be stuck to it. Disadvantages to this method include being messy (of course) and the risk of small children and pets ingesting it, so it’s best to use one of the other 3 methods if you have small children or pets. This is a simple plastic device that you can buy that attaches to your bed legs to catch any bed bugs that are climbing in or out of your bed. The bed bug will get trapped in the middle of the device so you can just inspect the device every few days to check. This is a pretty simple method. Bed bug monitors are one of the more recent inventions for detecting bed bugs. Typically, these monitors will emit small amounts of carbon dioxide (to simulate human breathing), which then attracts bed bugs to a contraption that catches and/or kills the bed bugs. Unlike the other three methods described above, monitors actually function better in unoccupied rooms, since they don’t have to compete with carbon dioxide emissions from humans. The disadvantage is that bed bugs will often continue to target humans even if there is a monitor present since humans emit more carbon dioxide than the monitors. So, those are several signs of bed bugs that you can use to determine whether you have a bed bug infestation or not. It’s always good to be vigilant to prevent any infestation from growing. 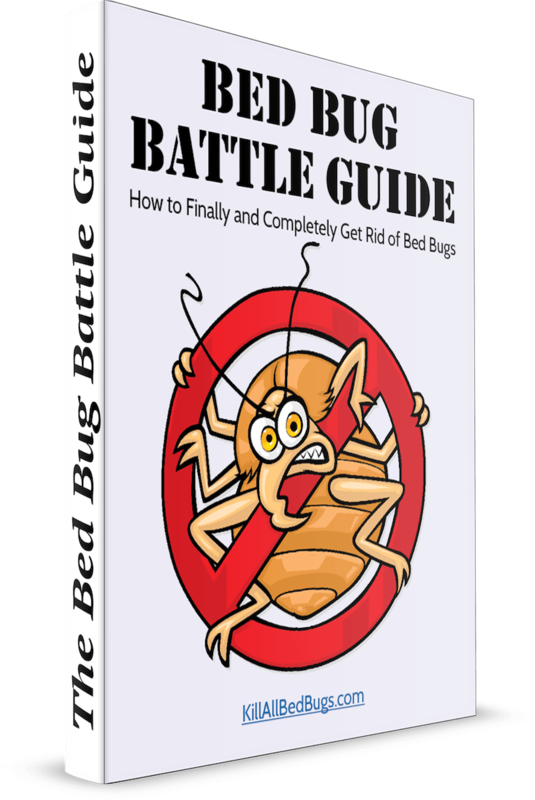 If you do find that you have bed bugs, then please head over to our “How To Get Rid Of Bed Bugs” page to see our recommendations for the most effective solutions at eliminating your bed bug problem. It’s good to know that bite marks can vary from one person to another. I have a number of bites on my back, but my neighbor who has had bug bites in the past claim that my bites are different. Maybe I can find a dog to sniff my bed like you mentioned for a more accurate conclusion.